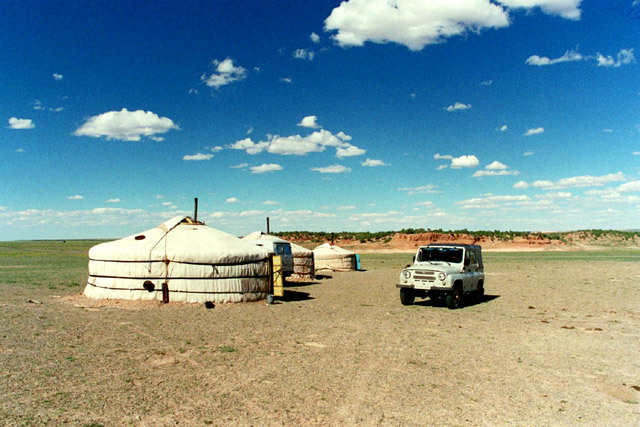 Start Camp near entrance to Gurvansaikhan National Park at Yolyn Am N43º32.705' E104º01.906' 2,159 meters . 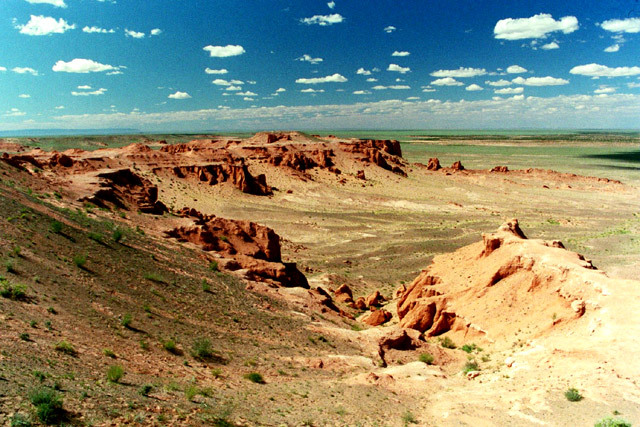 Dalanzadgad . . . .
Moltzog Els . . . .
Bayanzag (Flaming Cliffs) . . . . Weather: In the morning, clear (cloudless), sunny, hot and breezy. In the afternoon, partly cloudy, sunny, very hot and windy. In the evening, mostly clear, sunny, cool and windy. Windy and cold overnight. We have another slow and relaxing morning start. No need to rush, as we do not have too far to go. 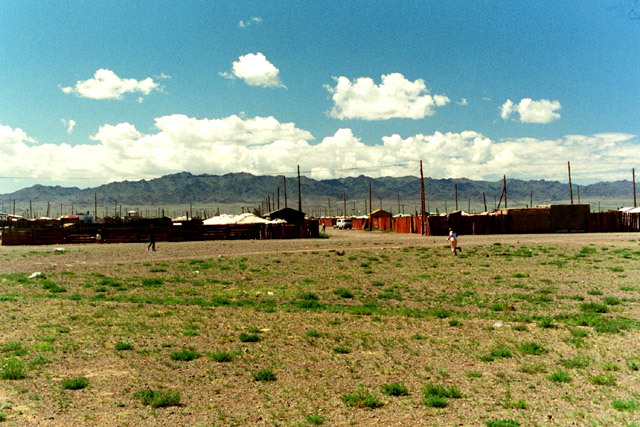 We leave around 10:30 AM and make our way down the slope of the mountain range to the aimag capital of Dalanzadgad. It takes us about an hour to reach there. First task is too look for petrol at a reasonable price. We spend some time driving from station to station, but do not seem to have any luck (but we will have to get some petrol, as Gerlee had yesterday emptied the jerry can into the tanks. So, we decide to first do our small amount of shopping at the local market. All we need is some bread. Guess Gerlee has asked about where petrol at a reasonable price can be found, cause we drive off after our shopping and find a station where we can fill up at Togrog 650 per liter (better than the 950 other stations were asking for, as compared to 420 in Ulan Baatar). Then it is time for lunch. We stop off at a small, local cafe and get some of the meat dumplings known as buuz. They are good, but not as good as the freshly made ones we had at one of the gers along the way. It is time to head on and we leave the town at 1 AM. We are always glad to exit there dreary, dusty towns and re-enter the open countryside. It takes us about four hours to get to Bayanzag, a bit longer than it should as we got a bit lost along the way. The guide book says that it is hard to find, and we certainly drove around looking for it. Our round about way took us near to the Moltzog Els, a smaller cousin of the Khongoryn Els dunes. Near there, we stop at one of the more dreary gers that we have seen on this trip. The ground is sandy and stony with very little vegetation. 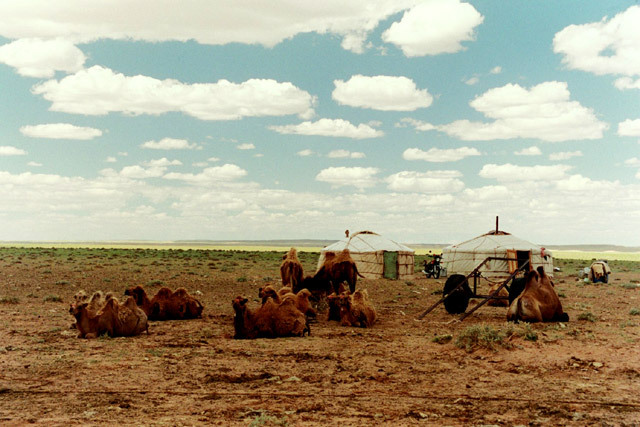 The area around the ger is covered with trash and camel dung. And the camels that are hanging out there are filthy and smelly. We ask for directions, and the owner draws in the dirt and camel dung the way we should go. We take some Polaroid pictures and are soon on our way. It still takes us some time to find the cliffs. It turns out the problem is that we are approaching from the top of the cliffs, so there are no geographical features to follow. In the end, Lars enters the GPS coordinates into his GPS unit and that helps us find the way, navigating cross country. 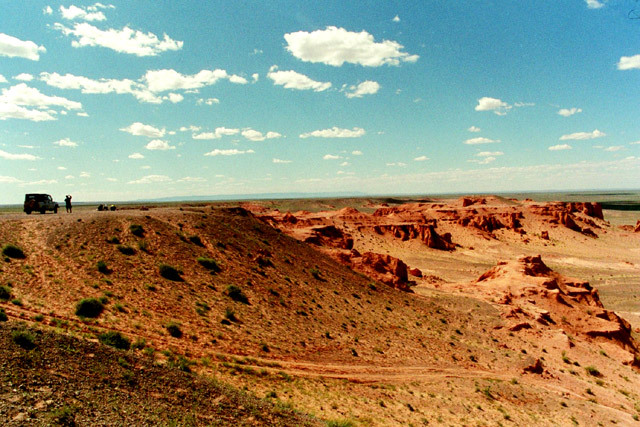 At 4:15 PM we arrive at the top of the Bayanzag cliffs, also known as the Flaming Cliffs. This area is famous for it's dinosaur fossil finds, with the first excavations taking place in 1922 by Roy Chapman Andrews. Many famous fossils from here can be found in museums all over the world. It is a beautiful spot and we are a little disappointed to see that it is not better protected. Jeeps drive all over the place and people dig for fossils and other stones all over the place. After we wander around the top for a while and take our pictures, we get back into the jeep and find one of the many tracks that wind there way down the cliff to the bottom. Once at the bottom, we make our way a bit further along the flat ground to a set of gers, arriving at 5 PM. We now need to decide whether to stay in a ger or camp for the night. In the end, we opt for the ger as it will be our last opportunity and the strong wind blows the sand everywhere. We set up our stuff in the ger and decide to have an early dinner as we want to go and watch the sunset at the cliffs themselves. In takes us about an hour to have dinner ready, and when we are eating our pasta some of the locals come to join us, including a mother and her small girl. We offer them some of our food - they seem interested in the food that we prepare. The small girl seems to enjoy it very much. After cleaning up, we spend some time relaxing before getting ready to head back to the cliffs. We drive off just after 8 PM and find a nice spot on some stones with an excellent view of the main part of the cliffs. We just sit back and relax and watch the changing colors as the sunset. While we are admiring the surroundings, Gerlee is taking care of his jeep, which he has such pride in. It is great to see and watch. As the sun continues to slowly make its towards the horizon, the colors of the cliffs slowly change from a dull brown to a bright red. It is wonderful to watch, as we sit on the rocks, the change slowly take place on the cliffs arrayed before us. It gives us time to contemplate that the last time this earth was exposed to the air, huge and fearsome; and small and cute; and all other strange types of dinosaurs roamed this land. What a different place it must have been back then. Like a curtain coming down in a theater, the moment the sun dropped below the horizon, the color of the cliff went from flaming red to the dull brown with which our private, little show began. It was time to head back to our ger and, or so we thought, our warm, comfortable bed. On the way back to the ger, we make one stop. We need to top up our cooking and washing water, so we take advantage of the well. 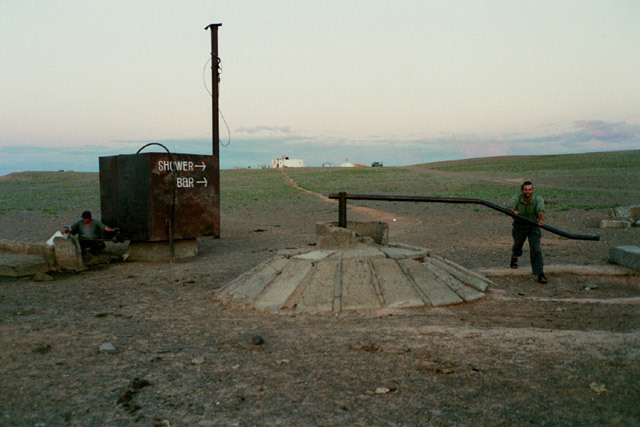 But this one takes some work to pump up the water from deep down underground. Normally, they will use a camel to turn the winch, but there is no camel here at the moment, Lars takes over that duty. 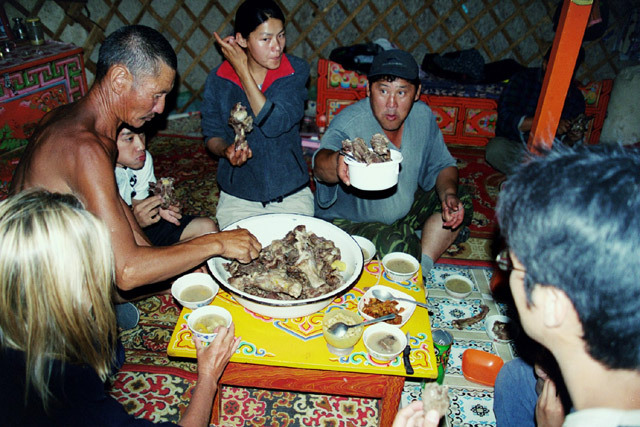 When we got back to the ger at 9:30 PM, they were just at the early stages of preparing a traditional Mongolian meal called khorkhog. We were quite lucky to be witnessing this, as this is one of their special dishes. 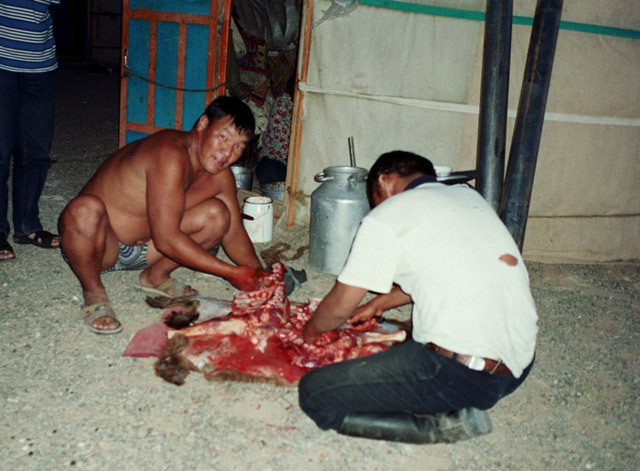 They had just slaughtered a goat (which we had fortunately missed) and were preparing the meat for the dish. The meat was chopped into fist sized pieces (we will get to the rest of the goat later). A fire had been started and rocks placed straight into the burning wood. 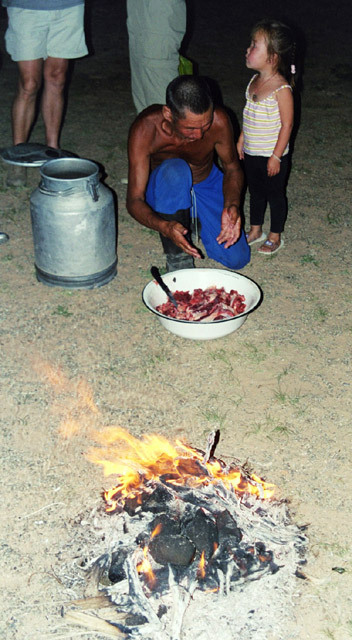 Then a milk urn was brought to the fire and partially filled with water and a couple of handfuls of sea salt and some chopped vegetables (but not too many) were added. Once the rocks were red hot, the urn was opened and the rocks and meat were alternately added to the urn very quickly. In between each batch going in, the urn was quickly closed. Once all the rocks and meat were placed into the milk urn, it was very carefully sealed and the whole thing was put straight onto the fire. Every minute or so, someone would reach over and give the urn a good shake from side to side. You could hear the rocks rattling around inside. This whole time, a small amount of steam was escaping from the urn with a loud hiss. The pressure inside, with the superheated water, must have be awesome. 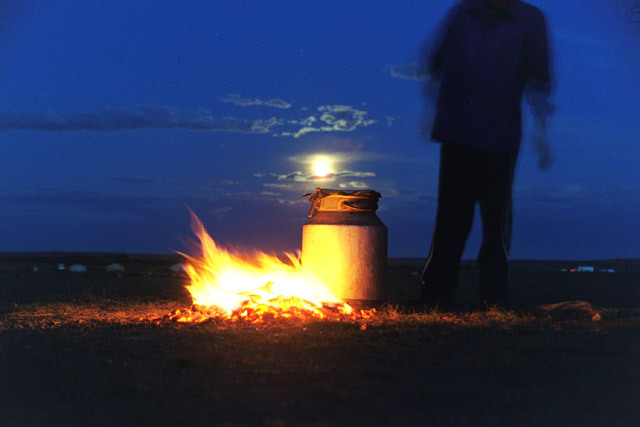 As the meat in the urn was cooking, the full moon began to rise from behind the cliffs in the clear night sky. Fantastic. Now, what was happening to the rest of the goat? Well, as you would know, nothing here goes to waste and the women were in one of the huts dealing with all the unpleasant parts, such as the intestine. They were cleaning them out and then they started to make sausages with them. 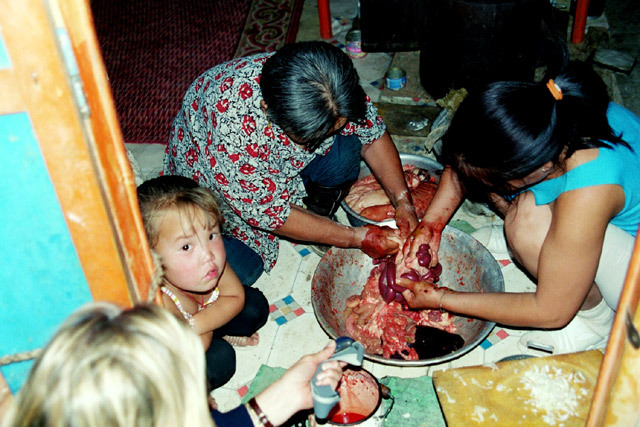 We were not quite sure what they were putting in there, but it included chopped onion and the blood of the goat. 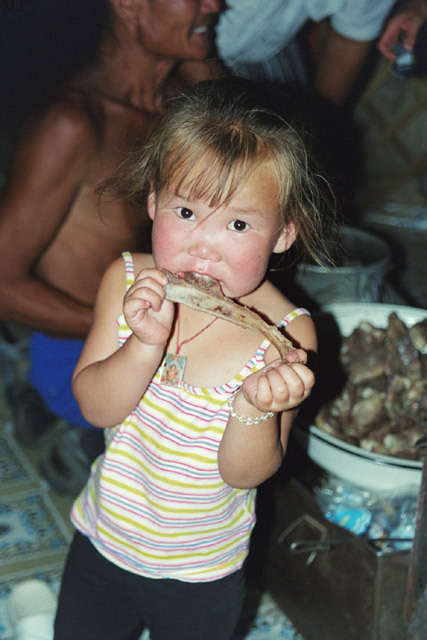 The rest were other indescribable parts of the poor goat. How they know when the meat was done, we would never know. They just seemed to know the perfect time to remove the urn from the fire. They let it cool down a bit and then they opened the urn. It was time to eat. We were all called into one of the gers and sat around on the floor. The stones and meat were removed from the urn and the stones, still very hot, were passed around from hand to hand. We were then all first served the soup - the water left in the pot with the vegetables. Then we were all handed pieces of meat still on the bone. No one used any utensils - it was all hands. Well, we are not big meat eaters, and we were having a tough time trying to bite meat off these bones, with all the fat. But the Mongols were just digging right in. We did as well as we could, and left what we could not eat (nothing goes to waste and it would be eaten the next day for lunch). Just after 11 PM we retired to our ger for the night. As we had learned after our first few nights, it was better to lay our sleeping bags out on the floor. Much more comfortable than the beds with the broken springs. Anyway, the beds were all too short for Lars. We got a small fire going and then went off to sleep.